It is months since you last saw the Hittite Amulet. I put him away in a boxfile before Christmas and refused to get him out again until the embroidery on the Glittering Nightcap was finished. Of course, it takes a while to gather ones’ wits, and restore the “flow” of a piece like thisl. 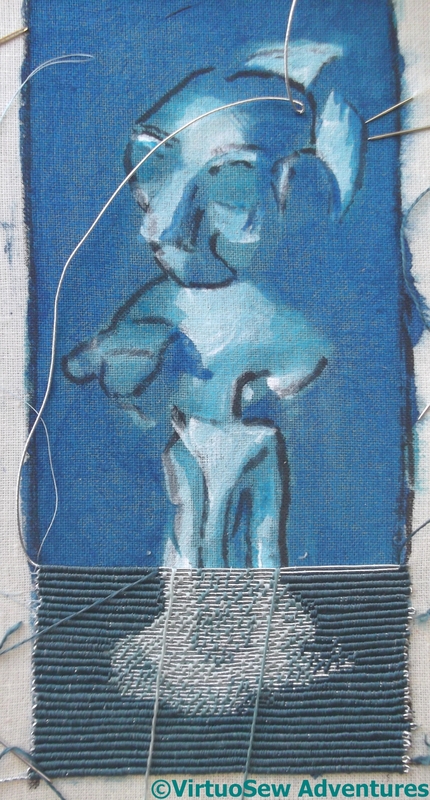 Since there are two alternating tasks – laying the silver thread and then covering it with silk as appropriate – it is hard to develop a sense of momentum. 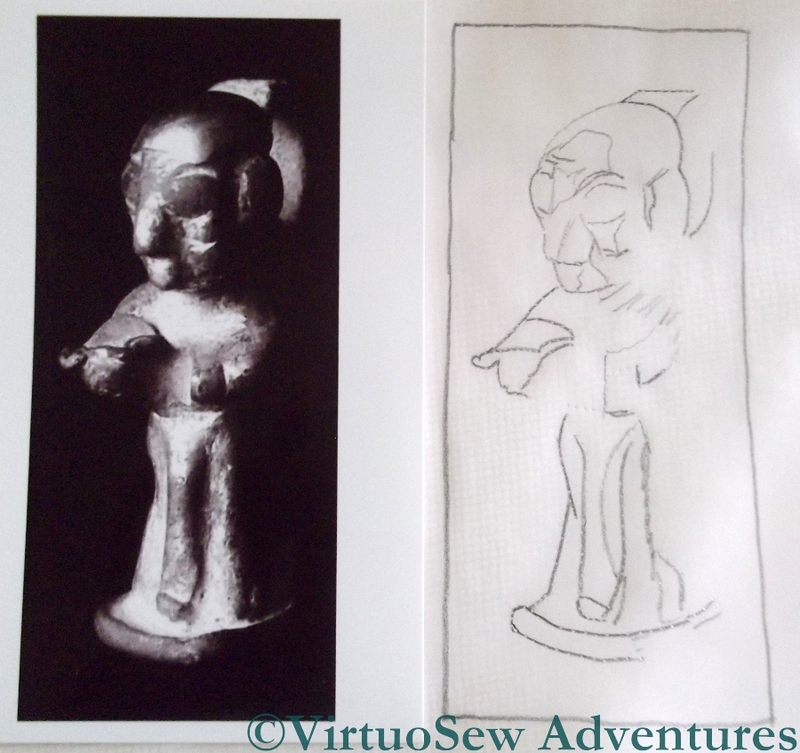 If I succeed, I may find he gallops away with me – which would be gratifying, because I have a lot more ideas for Dreams of Amarna pieces that I want out of my head and onto fabric! 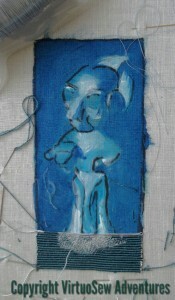 I’ve tautened the fabric again, and I am trying hard to remember not to let the lines of couching sag in the middle. 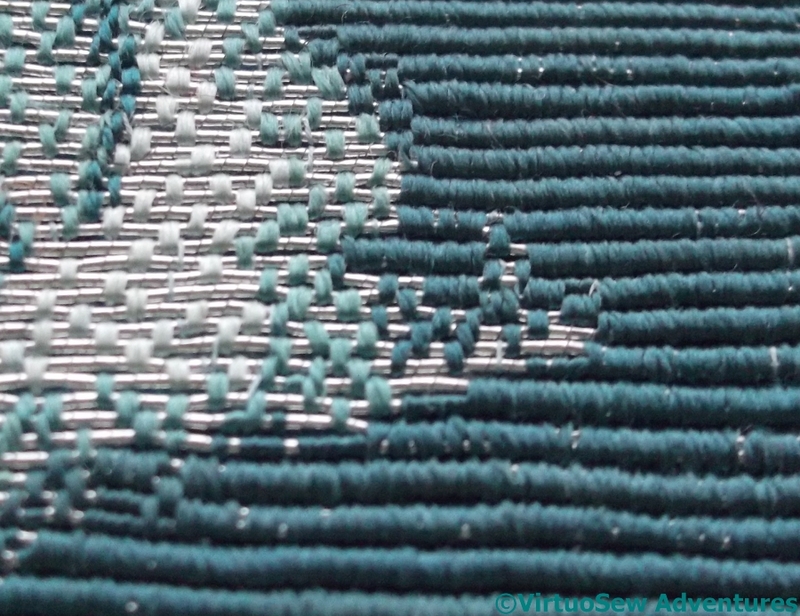 Sometimes I forget and stitch too tightly, but usually only for one row, so the situation does not get out of hand! 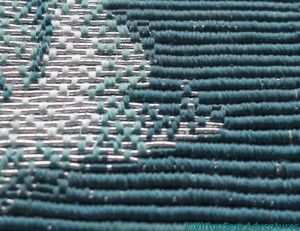 This close-up, oblique view, gives you a sense of the ribbed, “grosgrain” type effect of the background, and the speckling of stitches across the Amulet himself that give the light and shade. I really think it’s working! 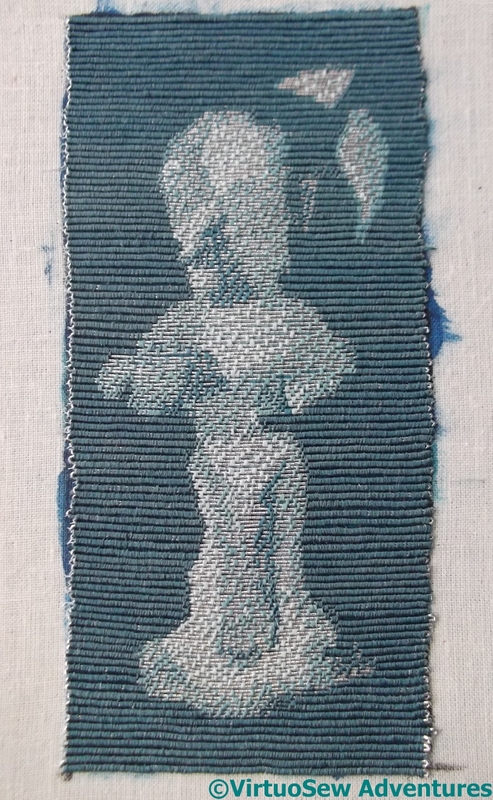 There was a slight, panic-stricken, pause in progress on the Hittite Amulet recently. 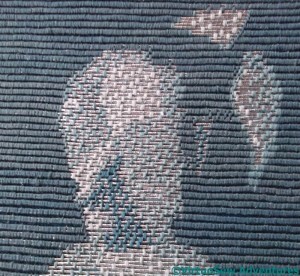 As you can see, I’ve barely completed a third of him, and I’ve used half of my darkest silk. 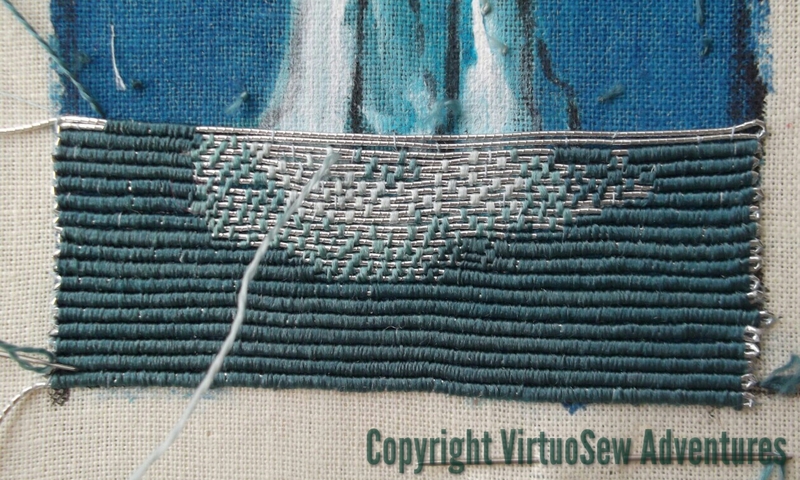 This is a graver situation than I anticipated, because since I bought the thread – three years ago! – the master dyer at Pearsall’s has died and they have closed the company. Fortunately, the remaining stock was sold to Tristan Brooks Designs in America, and while it is extremely frustrating to have to have thread dyed in England shipped back to England from the States, the two skeins I bought do seem to match well enough. 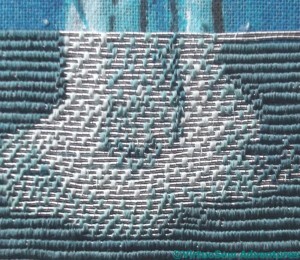 I’m going to alternate strands from the new skeins with strands from the old, all the same – that should help to make sure any change is gradual. When I was at the Knitting And Stitching Show in Harrogate, I bought an extra skein from Laurelin Specialist Embroidery. 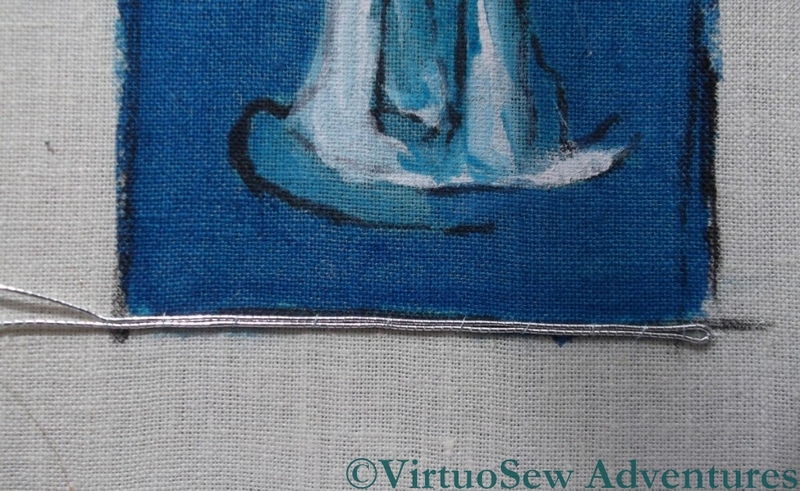 The colour is very slightly brighter than the darkest one I am using for the background, but I am hoping that it will help to add a bit of depth and strength to some of the shadows on the Amulet himself. 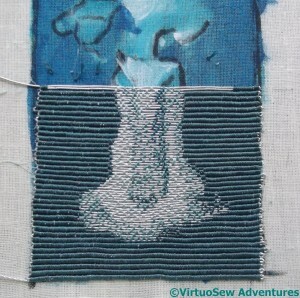 You can also see in the close-up that I’ve nearly got the rows straight again after their wanderings. Now I know I have to be careful, I hope that the problem won’t arise again. 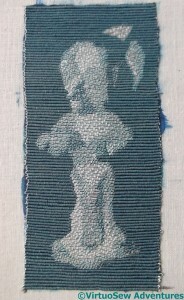 So, with the Hittite Amulet painted on my fabric, stretched, and ready to go, I have now settled down to stitch. 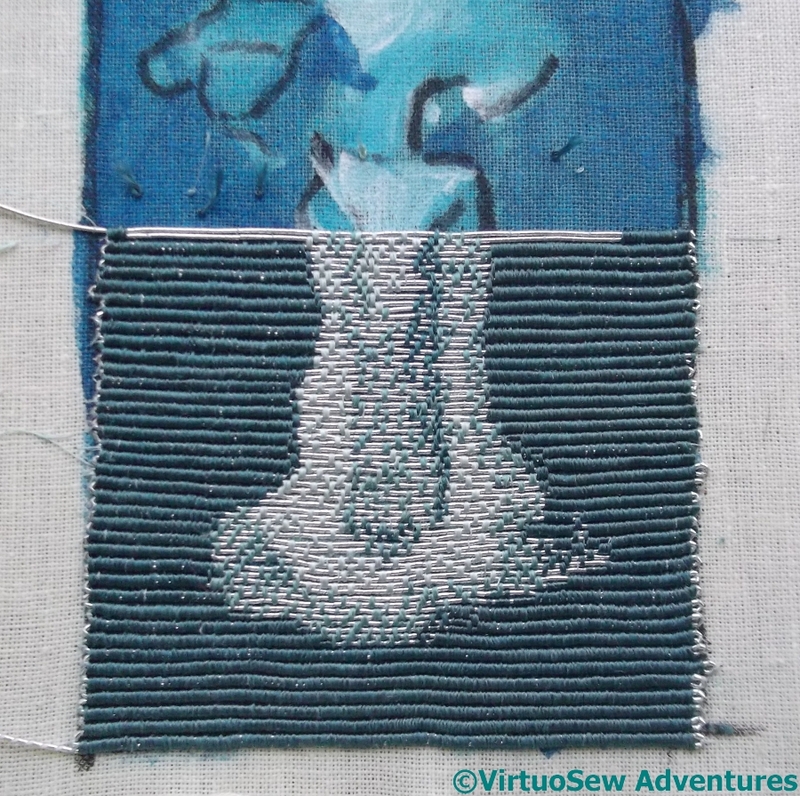 I have decided to aim for a more strongly corded effect in the background of this piece than I used for Christus Natus Est, so each row of stitches will be worked over two rows of silver. 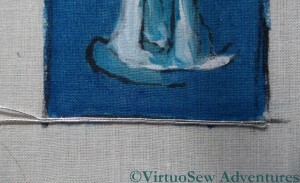 This in turn means that I will spend a lot of time wrangling the springy silver thread to make it lie close and straight. 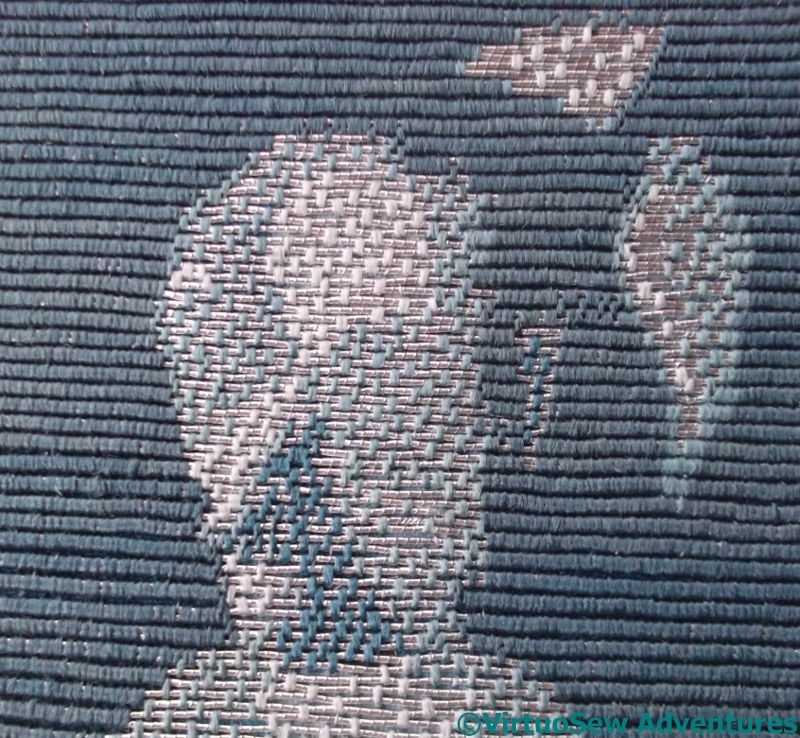 Even the first row was a challenge, and as I reach the core of the spool and find the thread that has been wound closely around it, I am expecting the challenge to become even more challenging! 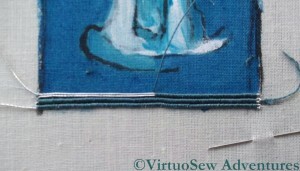 This second photo shows the stitching halfway along the third row of background at the base of the piece. 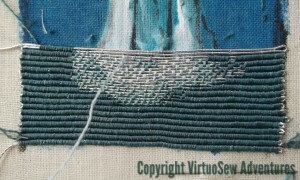 You can see the ribbed effect is already building up, and it will create a good strong background. If I get the rest of it right, the Amulet should almost pop out of the surface at me! I am still trying to decide how to organise my stitching of the Amulet himself, but I plan to allow the silver to show through across the entire design, spacing my silk stitches accordingly. 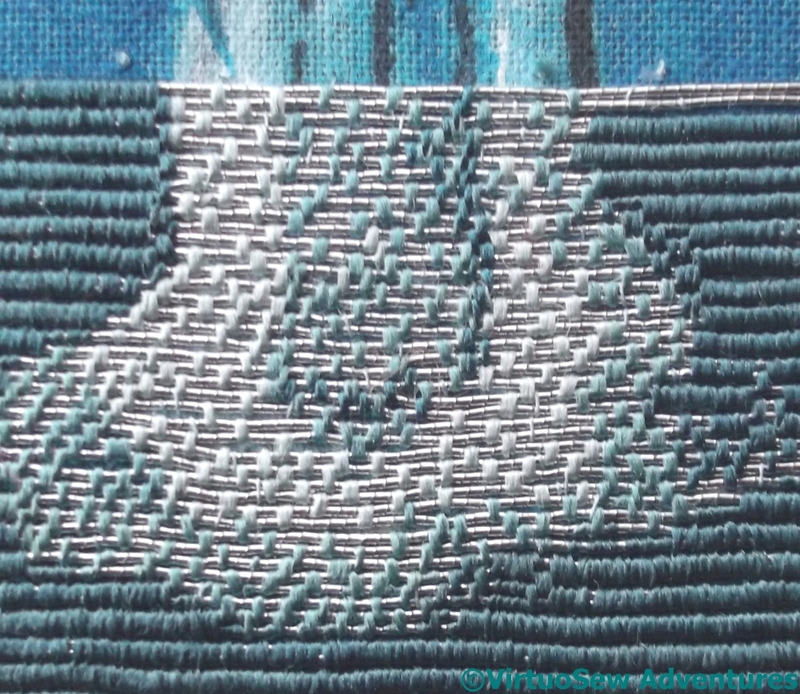 The stitches for the design may cover two silver threads or only one, and I am going to try to space them using the original black and white photo for guidance, to create some sense of the shadows breaking up across the surface.